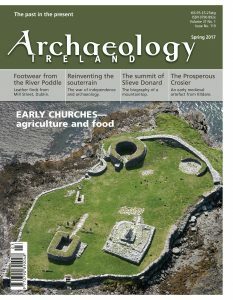 High, low and in between—this current issue of Archaeology Ireland roams across mountains, bogs and down into souterrians to bring you the latest in Ireland’s archaeological investigations and discoveries. Examining the cultural biography of a mountain—The Great Cairn on Slieve Donard, Co Down, is an irregular pile of stones that appears to have been a Neolithic passage tomb, later converted into a cell by the hermit St Donard and is the highest passage tomb known in Britain and Ireland. The Prosperous Crosier, one of the most important artifacts surviving from medieval Ireland, is the oldest securely dated crosier from Ireland and Britain but also one of the oldest in Europe with a tenth century date. This article examines the evidence for its attribution to a Dublin workshop and religious site. The ordering of religious space is revealed in the results of geophysical surveys at Lullymore Island, Co Kildare. The degree of conscious spatial organization in this remote bog-island church settlement suggests a regular pattern for all religious settlements and not just the more prestigious religious foundations. In the ongoing Know Your Monuments series, early churches and agriculture and food are examined with a focus on the involvement of ecclesiastical settlements on agriculture and food production in the early medieval period. In a flash—photographic survey of a souterrain at Killala Co Mayo, reveals a small stylized cross carved on the underside of one of the slabs supporting the roof of the passage—signs of an earlier ecclesiastical enclosure? And the later re-use of souterrains during the War of Independence is examined.